I have previously mentioned my work friends- the Vegetarian and the Gluten-Free nurses. The more I get to know them, the more I am curious about the foods they eat and their attitudes about food. I have also started to evaluate my own opinions about food. I was raised in a household where my father insisted dinner was not dinner if meat and potatoes were not on the table. So there was meat every night. Potatoes most nights. If not potatoes, then maybe macaroni and cheese or rice. Meat and starch = well balanced meal. And there is something to be said for this meal choice. My father is a farmer who worked 12 hours outside. He didn’t have to worry about calories packing on the pounds. But now that he is older (the big 50! ), he has asked my mother to cook a little different. More vegetables and fish and a general decrease in the amount of food cooked. He has found that he packs on the pounds faster than he can work them off. I hope that never happens to me (but something tells me it will). This food blog has totally changed how I see food. I am more aware of every bite I put in my mouth. Every ingredient I use. The cause and effect of everything. It has made me try to eat healthier and embrace other’s eating traditions. Hence today’s recipe. I had never cooked eggplant before. 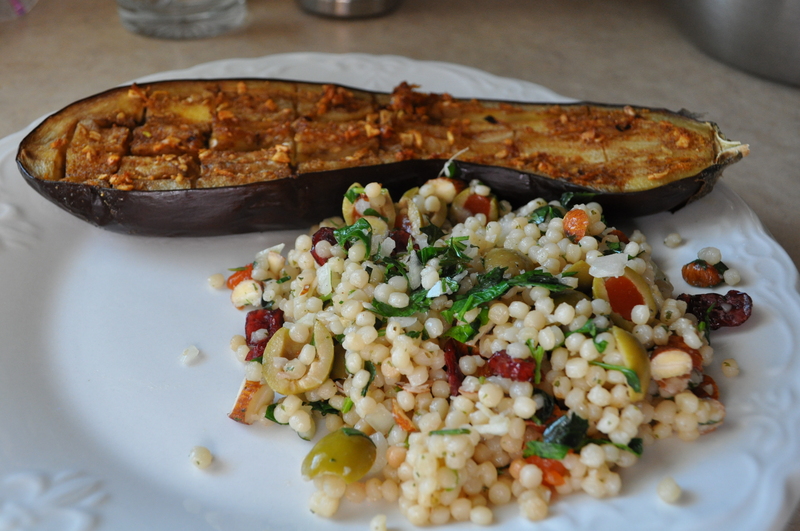 It worked out pretty good, though people who don’t like squash won’t like the eggplant. Meanwhile, cook couscous according to package directions. Stir in olives, onion, currants, parsley, cilantro, pistachios, and lemon juice. Season to taste with salt and pepper. Let stand for at least 30 minutes for flavors to meld. Serve eggplant warm or at room temperature. Place an eggplant half on each plate. 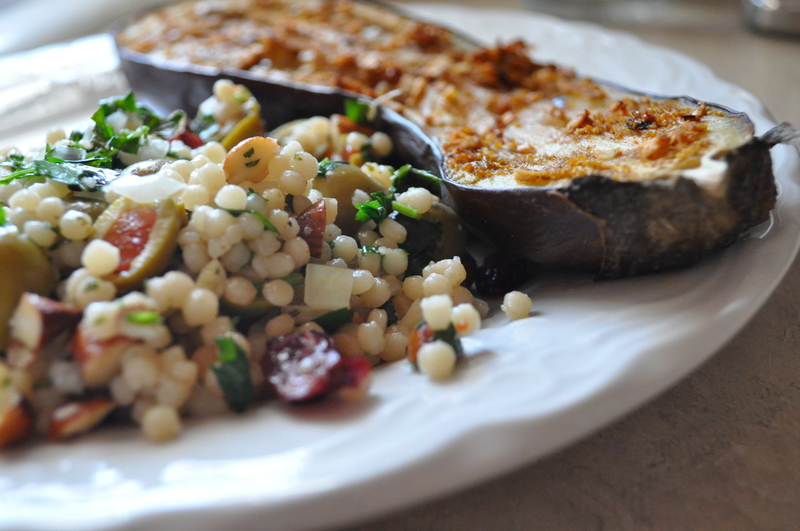 Spoon some couscous salad and a dollop of yogurt alongside. Garnish with cilantro if desired. Looks delicious. Our food blog also makes us think about ingredients. But alas, gives us an excuse to come up with a new cocktail weekly!